Fis nordic junior world ski championships/Fis u23 world ski championships cross-country 20 – 27.1. 2019 Lahti. And my dog Malla was there yesterday. Great Moon shots and I love your dog. Have a wonderful weekend. Hello Anu, I just love your moon series. I fell asleep and missed the whole event. Love your sweet pup, beautiful photos. Thank you for sharing your post. Happy Saturday, enjoy your weekend. PS, thanks for the comment on my blog. Hello Anu. I'm afraid I missed the eclipse - too lazy to stay up and watch. Mallu is a very beautiful dog. Hope he enjoyed the skiing. Beautiful pictures of the lunar eclipse and what do you have a cute dog. Hello Margaret, Eileen, Phil and Irma. ...I missed the eclipse, we had a blizzard that night. Your dog blends in! Hello Tom and Anne. Thank you for your comments. Lovely blood red moon, great to see. I couldn't, cloudy. Did your dog howl at the moon? Thank you for your comment Bob. I am lucky – my dog does not howl at the moon. Nice shots of the moon! 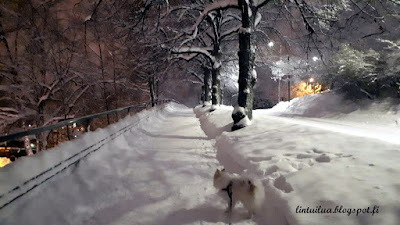 Regards to Lahti...we were there last autumn. Well done, getting the moon. We are too cold and were cloudy that day! what a beautiful sequence of moon pictures. it was very cold that night and i only photographed the blood moon. i did see a little bit of the eclipse!! Gorgeous photos of the moon! What a cute dog too. Beautiful moon shots, it was cloudy and raining here so no shots at all. Your dog is a cutie and I love the photo with the dog waiting on the snowy path. Hello Italiafinlandia, Jenn, Carol, Debbie, Lois and Bill. Thank you all for your comments. Hienot kuunpimennyskuvat! 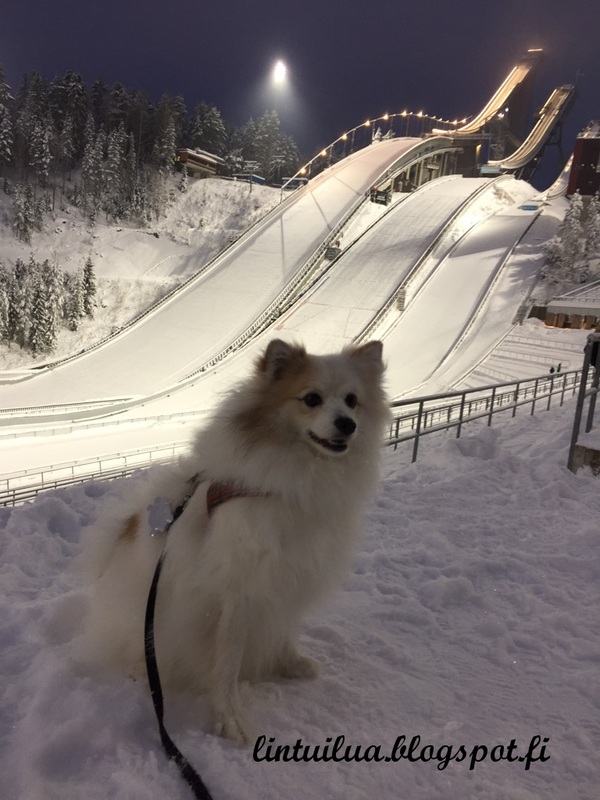 Malla on päässy poseeraamaan hiihtopaikoille! Beautiful capture of the eclipse. Great pose by your dog. What kind of dog is Malla, she looks ready for the weather. 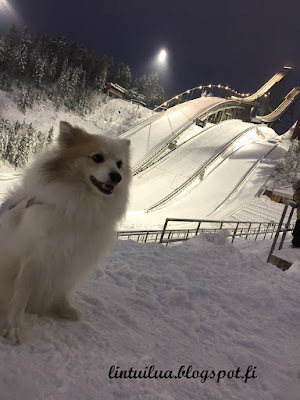 How cool to have a ski run near you and watch the trials. Thank you for your comment, Jeanna. Malla does not care about the cold. It is a German Spitz Mittel. The moon is amazing ... and Malla looks like she loves the cold weather. And she loves posing for You! Thank you Sallie. 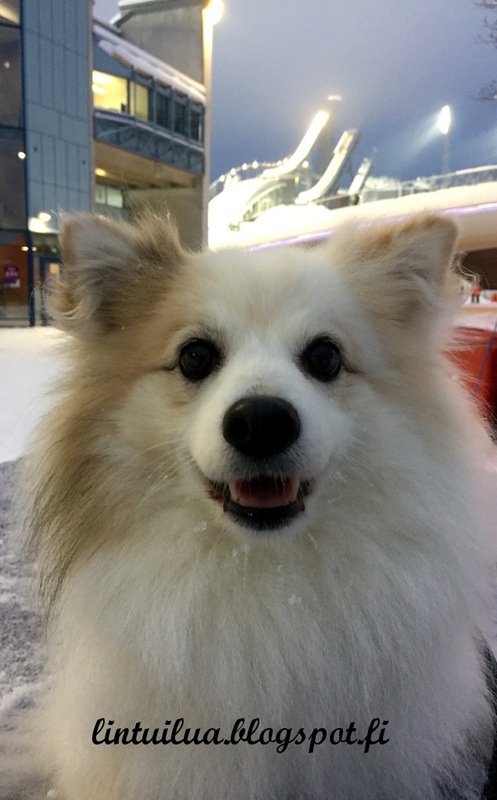 Malla loves winter and snow. Your moon photos are spectacular! And your Malla blends into the snow scenes! Stay warm this week! Hei Anu! Hienot kuu-kuvat sinulla! Great series of photographs of the eclipse.